Antarctica's Larsen Ice Shelf is disappearing section by section. A fast-growing rift, one of the largest ever seen, is now teetering on the edge of breaking away from the glacier. Science correspondent Miles O’Brien explores how scientists have tracked the steady loss of ice. But first: There's a giant crack in an ice shelf of the Antarctic that's been the source of much attention this winter, and is raising new concerns over the larger stability of the ice there. Miles O'Brien has the story, the focus of this week's Leading Edge. If glaciology is all that it is cracked up to be, this long, fast-growing rift in the Antarctic ice is a huge iceberg in the making, one of the largest ever seen, about the size of Delaware. Welcome to the Larsen Sea Ice Shelf, teetering on the edge of breaking away from the glacier. So, we have known about this for quite a while, right? KELLY BRUNT, University of Maryland: We have certainly known about the bulk of this rift for a while. It's this accelerated propagation that's really new. Kelly Brunt is a glaciologist at the University of Maryland and NASA's Goddard Space Flight Center. She used a wall of monitors there to show me the growing rift, fueled in part by rising air and sea temperatures. If the glaciers in West Antarctica all dropped into the water, global sea level would rise by more than 15 feet. Brunt showed me the big picture, a composite of images from several satellites. This is how the glacier ice flows here. Ice flows from the center of the continent out to the edges, much like syrup on the center of your pancake flowing towards the edges. And you can see there are areas where it's moving pretty slowly, and then there are areas where it's moving very quickly. And those quick places are generally in our areas of ice shelves. So, when we think about ice, we think about something static. It's not static, is it? Not at all. Actually, it's highly dynamic. You can see from this image it looks to me a lot like a river system. Ice shelves are connected to the glaciers that sit on land, but they are also floating, like ice cubes in a glass of water. If you had a drink with ice cubes in it, as those ice cube melts, they don't add to the height of the water in the glass. So when ice shelves break down and collapse, they do not have a direct impact on mean sea level rise. However, they have an indirect effect. These ice shelves buttress the flow of the ice upstream, the ice that's flowing into the system. And when you lose that buttressing force, you allow the upstream glaciers to flow faster. So that's similar to putting more ice cubes into the glass and letting those melt. Ice falls off the edge of glaciers all the time. It is part of a natural process called calving. Kelly Brunt says it is important to judge the size of the piece that breaks off relative to the size of the glacier that is behind it. She says your fingernails offer a handy model. If you break your fingernail inside the white part of your fingernail, you probably don't think much of it. If you break it below the white part, you put a Band-Aid on it, you think about it and you keep an eye on it. If you lose your whole fingernail, I don't know what happens. It's pretty catastrophic. This represents losing the whole fingernail. Like so many features in Antarctica, the Larsen Ice Shelf is named for a famous 19th century explorer. And it is disappearing, section by section, identified by letters. Larsen A disintegrated in 1995. And, in 2002, a series of satellite images captured the end of Larsen B in dramatic fashion over the course of six weeks. The piece that broke off was the size of Rhode Island. Losing this much ice, losing ice that represents roughly the state of Rhode Island in a month-and-a-half, just far exceeded anybody's expectations of what could happen in the time scale that it could happen. So, it was kind of like, we have to rethink things here a little bit. I mean, this is a wakeup call. This was absolutely a wakeup call. Scientists track the ice using a half-dozen U.S. and European satellites, including Landsat, which gathered these images. But some of their best data came from a satellite called ICESat. Launched in 2003, it ceased operation in 2009. It precisely measured the glaciers using laser beams. This is quite a few years of ICESat data merged together to get a sense in meters per year how our ice sheet is changing. And you can see, the big picture here is that our ice sheets are changing where they are in contact with both our warming atmosphere and a warming ocean. So, it's basically along the fringe of the continent. When ICESat failed, NASA started tracking the ice using radar and lasers on board low-flying aircraft. The IceBridge program is NASA's largest air campaign ever, but it still could not match the eye above the sky. It goes without saying that you would view these satellites, the capability to look at this, as essential? What we're talking about is a calving of an iceberg that's a size of a state. To get that, you really need a satellite to be able to see all of it in one shot. It's a function of scale and repeatability to go back and look at that area again with the satellite that makes these the perfect tools for looking at the large-scale change that we're seeing in this region. Next year, NASA plans to launch a new and improved satellite to watch the ice. Most likely, the Larsen C Ice Shelf will be long gone by then. As the climate warms, there is no end in sight to the steady loss of ice here. 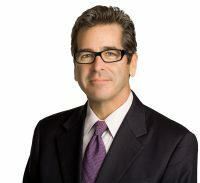 Miles O'Brien, the PBS NewsHour.